Airmen assigned to the 57th Aircraft Maintenance Squadron Lightning Aircraft Maintenance Unit line up in formation for roll call at Nellis Air Force Base, Nev., July 24, 2018. 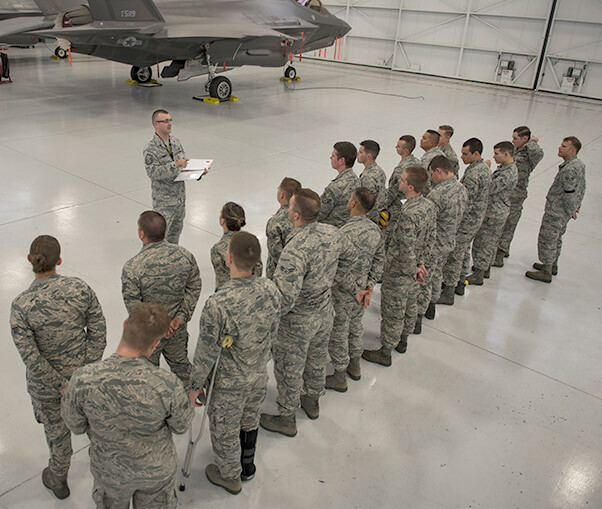 Airmen must attend roll call to get the task list for their shift. The F-35A Lightning II fighter jet is not only the newest addition to the Air Force’s arsenal of aircraft, but it is also one of its most advanced. 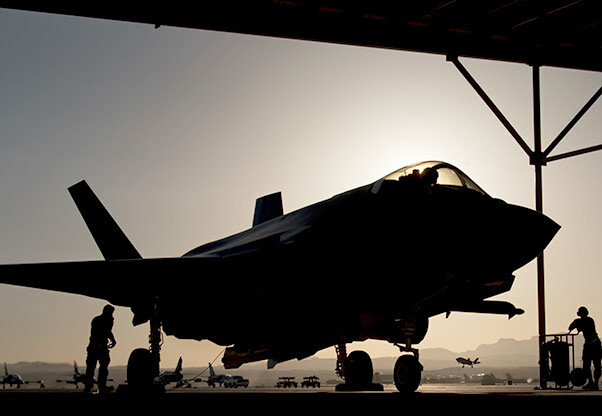 With its improved stealth, avionics and logistical support, the aircraft can enter enemy radar, accomplish its mission and leave the hostile area without being seen. Behind all that technology is a skilled team of Nellis Air Force Base Airmen at the 57th Aircraft Maintenance Squadron Lightning Aircraft Maintenance Unit working around the clock to ensure the F-35A maintains its lethal edge. Like most AMUs, Lightning has different shops to focus on specific maintenance roles for the jet. Crew chiefs, avionics technicians and weapons loaders are all technical experts in their specific role. “Avionics will take care of the electrical systems, crew chiefs will take care of all the moving parts and weapons will load the munitions onto the aircraft,” said Airman 1st Class Zachary Cray, 57th AMXS Lightning AMU crew chief. With almost anything that can be taken apart and put back together, there is an instruction manual; however, the Air Force’s focus on empowering innovative Airmen has allowed today’s Airmen to develop improved processes to replace decades-old manuals. Airman 1st Class Nick Gonzales, 57th Aircraft Maintenance Squadron Lightning Aircraft Maintenance Unit armament systems technician, inspects a toolbox before checking it out to aircraft maintainers at Nellis Air Force Base, Nev., July 24, 2018. Gonzales currently works in the support section, where he oversees tools and equipment inventory. 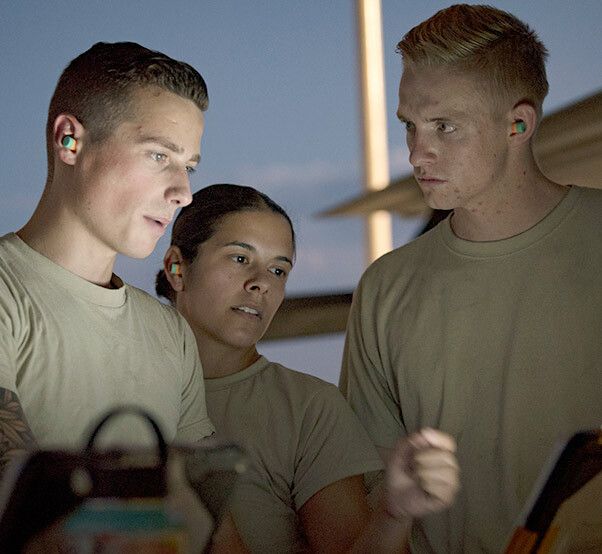 Edwards Air Force Base, Calif., Luke AFB, Arizona, Hill AFB, Utah and Eglin AFB, Fla., are just some of the other homes of the F-35A and each maintenance unit communicates new struggles and solutions between each other. Staff Sgt. 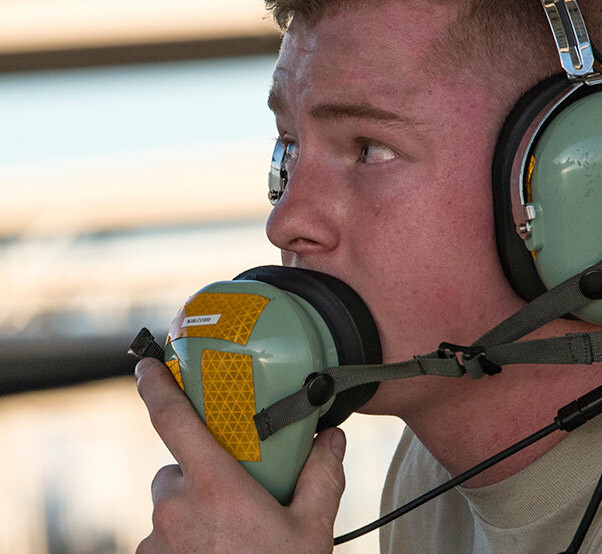 Bryan Roberts, 57th AMXS Lightning AMU weapons loader, said a lot of the NCOs in the unit are coming from other airframes and have to learn the F-35 system from scratch; whereas, the younger guys have recently completed the Air Force’s formal training familiarization with the aircraft. Prior to becoming the activity security manager, Staff Sgt. Joshua Harris, 57th AMXS Lightning AMU activity security manager, worked on the A-10 Thunderbolt II close air support aircraft. Airmen 1st Class Zachary Cray and Chayce Ardoin, 57th Aircraft Maintenance Squadron Lightning Aircraft Maintenance Unit crew chiefs, perform pre-flight checks at Nellis Air Force Base, Nev., July 23, 2018. Crew chiefs are responsible for the maintenance, launch and recovery of the aircraft. 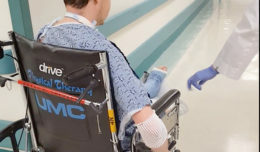 Cray said the F-35A is still in its early years, which means there isn’t decades of battle-tested procedures that were innovated by maintenance Airmen like there are with older aircraft. 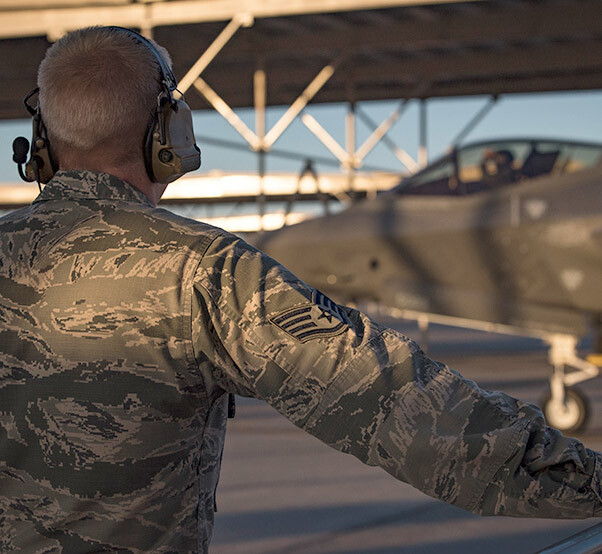 Harris said communication between the different shops is important because if the F-35A has an avionics issue, it might still require weapons and crew chiefs to perform initial maintenance so that the avionics shop can fix what they need to fix. 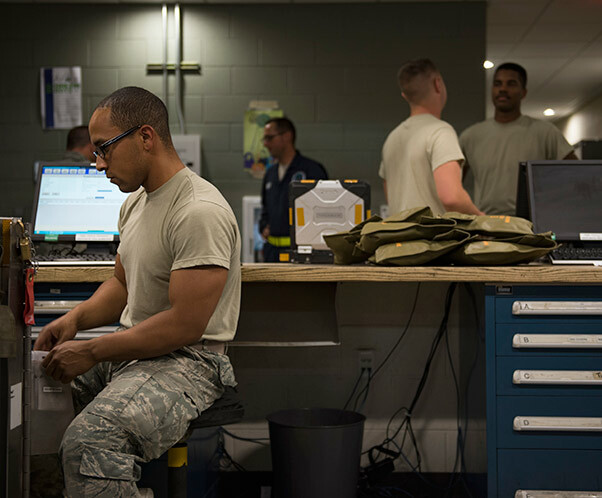 When the tasks are done, Airmen will usually gather in the break room to study for upgrade training tests, play cards or ping pong, or just chat and catch up with each other until the next shift transitions in. Staff Sgt. Joshua Harris, 57th Aircraft Maintenance Squadron Lightning Aircraft Maintenance Unit activity security manager, observes an F-35A Lightning II fighter jet taxi to the runway at Nellis Air Force Base, Nev., July 23, 2018. Harris previously worked on A-10 Thunderbolt II close air support aircraft before transitioning to the F-35A. As with most aircraft maintenance squadrons, Lightning AMU is a three-shift, 24-hour operation consisting of days, mids and swings. It takes a lot of teamwork, innovation and preparation to be able to fly eight to twelve sorties, or flights, per day. The Airmen of Lighting AMU are no exception. It takes a team to keep the Air Force’s newest fighter jet in the air. Between working on the flightline and hanging out in their free time, the Airmen of Lightning AMU have found that balance that keeps them at the forefront of Air Force innovation and readiness. 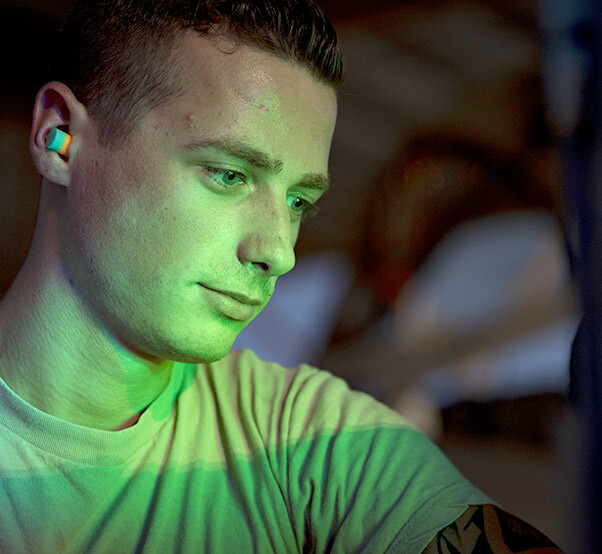 Airman 1st Class Chayce Ardoin, 57th Aircraft Maintenance Squadron Lightning Aircraft Maintenance Unit crew chief, talks into his headset at Nellis Air Force Base, Nev., July 23, 2018. Crew chiefs use headsets to communicate to each other and the pilot, during pre- and post-flight checks. Airman 1st Class Zachary Cray, 57th Aircraft Maintenance Squadron Lightning Aircraft Maintenance Unit crew chief, talks to other crew chiefs after launching his jet at Nellis Air Force Base, Nev., July 23, 2018. Crew chiefs are responsible for the maintenance, launch and recovery of the aircraft. 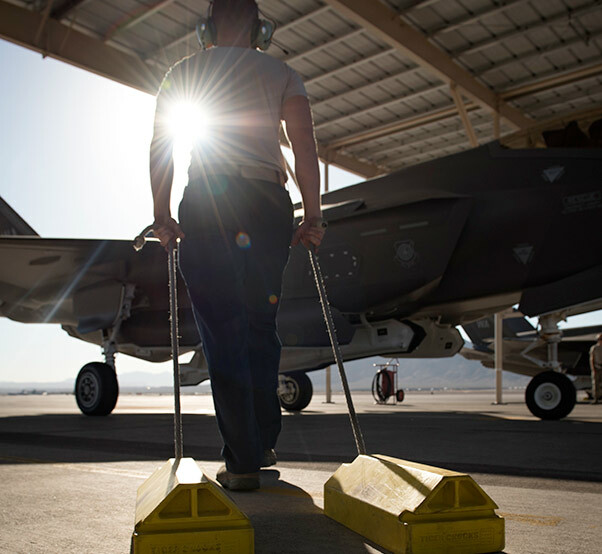 Senior Airman Dustin Hilton, 57th Aircraft Maintenance Squadron Lightning Aircraft Maintenance Unit crew chief, drags a set of chocks to an F-35A Lightning II fighter jet at Nellis Air Force Base, Nev., July 23, 2018. Placing chocks under the tires of an aircraft prevents it from moving until the pilot is ready to taxi the aircraft to the runway. Senior Airman Alan Roach, 57th Aircraft Maintenance Squadron Lightning Aircraft Maintenance Unit armament systems technician, performs maintenance on an F-35A Lightning II fighter jet at Nellis Air Force Base, Nev., July 24, 2018. Armament systems technicians are responsible for testing and loading ordnance onto aircraft. Senior Airman Alan Roach, Staff Sgt. Samantha Stimeling and Airman 1st Class Nolan Delongey, 57th Aircraft Maintenance Squadron Lightning Aircraft Maintenance Unit armament systems technicians, perform tests on an F-35A Lightning II fighter jet at Nellis Air Force Base, Nev., July 24, 2018. Armament systems technicians frequently test and evaluate the weapon systems on aircraft to ensure everything is in working order. Staff Sgt. 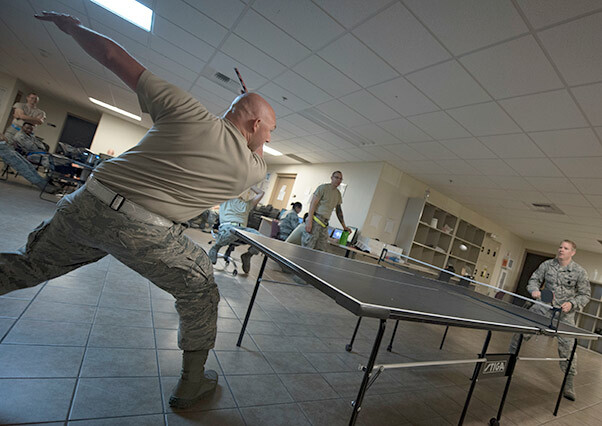 Joseph Johnson, 57th Aircraft Maintenance Squadron Lightning Aircraft Maintenance Unit avionics technician, plays table tennis with Staff Sgt. Joshua Harris, 57th AMXS Lightning AMU activity security manager, between shift changes at Nellis Air Force Base, Nev., July 23, 2018. Airmen usually get time to unwind toward the end of their shift if their tasks are done for the day.